With New York musician, Ljova in town for our long-awaited, two-week collaboration, several more concerts as part of our émigré series and lots of education work, particularly with young primary school students, the Spring months at City of London Sinfonia have certainly been jam-packed. A unique mix of Klezmer, classical music, Balkan Gypsy and jazz, we’ve loved getting to know New York composer and musician, Ljova’s music over the last two weeks. Travelling over 3500 miles to join us for a two-week period, Ljova has performed alongside our musicians in several projects and concerts, including our recent CLoSer at Village Underground, Key Stage One projects with young children in Harrow and Tower Hamlets and participated in our L’Chaim outreach work with Jewish Care Homes. Just this week, he joined us in a DASH Arts café at Rich Mix, Shoreditch, and we look forward to welcoming him at Cadogan Hall this Saturday for our next Crash Bang Wallop family concert, Bon Voyage! Our concert last Saturday at Cadogan Hall, From Hollywood to New York, was great fun. We were joined by YCAT cellist, Michael Petrov, who performed Dvorak’s fantastic Cello Concerto, and our Principal Conductor, Michael Collins who lead the orchestra through a range of Hollywood classics, including Herrmann’s soundtrack to North by Northwest and Korngold’s Adventures of Robin Hood Suite. 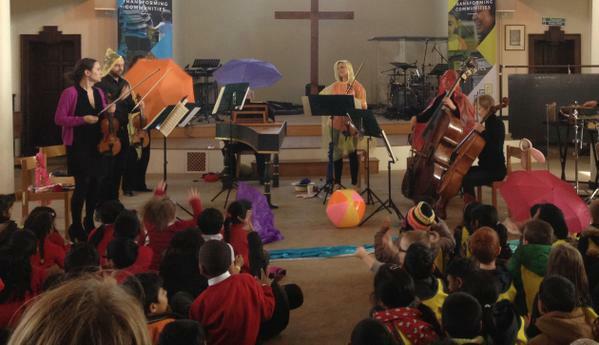 In addition to the expanse of education work Ljova has done with the orchestra over the last few weeks, our education team have been busy in projects across the country, including First Time Live in Shepshed, a Crash Bang Wallop family concert in Tunbridge Wells, projects in St Joseph’s Hospice and our usual work at the Royal Hospital of Neurodisability and Evelina’s children hospital. We’ve been having plenty of fun in the office too as we get ready (and very excited) for our imminent tour to Mexico with some wardrobe preparations (spot the sombreros..). 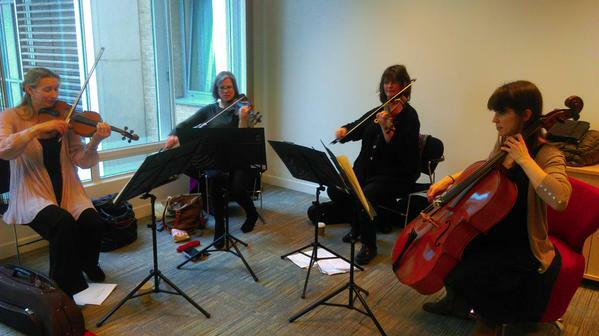 We also celebrated our Chief Operating Officer, Elaine’s 20th anniversary with the orchestra (read some of her favourite memories of her time with CLS here) and welcomed some gorgeous canine visitors to the office. Crash Bang Wallop! Bon Voyage!